These no-bake mango coconut balls are super easy to make and are raw, vegan, gluten-free, and paleo-friendly. 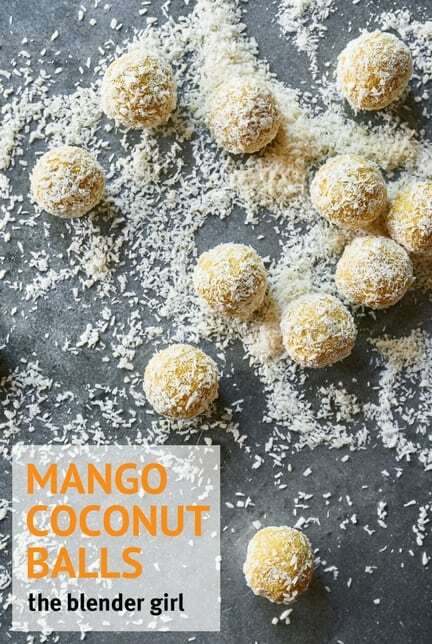 The combination of mango and coconut never gets old, and these mango coconut balls is a super easy way to get your fix. 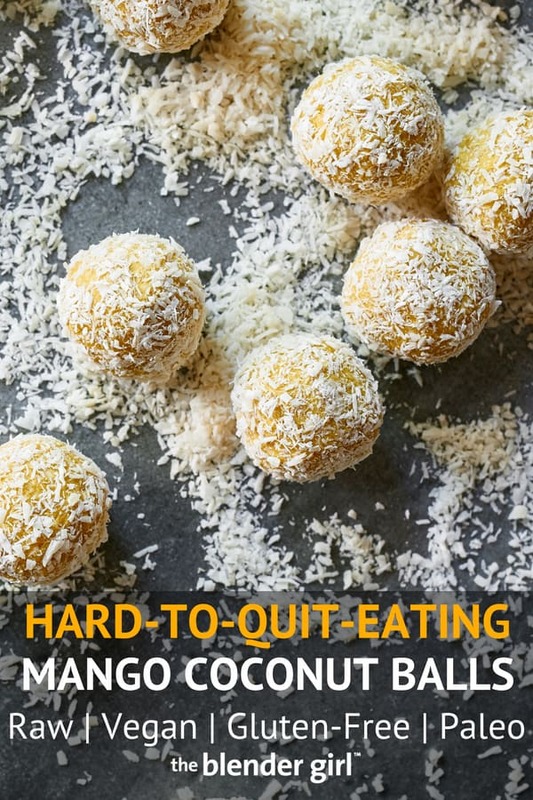 To make these mango coconut balls, just throw all of the ingredients in your food processor and pulse until a ball forms. Roll in coconut and freeze for about 20 minutes and devour. I was inspired to create these no-bake coconut balls after I was overwhelmed with emails about the chocolate balls. I was determined to make coconut balls that were just as fabulous. My friends Olivia and Tara helped me perfect these mango coconut balls last weekend. When we all put our spoons in to test the blend, we felt like there was just a little something missing. I was thinking of putting some freshly grated ginger in the mixture to boost the flavors and give the mix a bit of a kick. But I was afraid it would make these balls a bit unpalatable for children. Olivia had been grating lemon zest for the lemon asparagus risotto and there was a delicious aroma of citrus dancing around our noses. 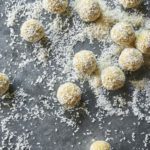 No sooner had the words rolled off her tongue, I had snatched the lemon zest with the enthusiasm of a raw foodie on too much date paste and these mango coconut balls were a-pulsing with glee. This sentiment was echoed by Mika, Liz and Gina when they tried these mango coconut balls. These mango coconut balls are a fantastic allergy-free snack for children. However, please note that because there is coconut oil in these coconut balls they do not fare well in the heat as the coconut oil will melt. Keep these coconut balls in the fridge or freezer. If you can’t find dried mango, these coconut balls are also amazing with dried apricots. These mango coconut balls are raw, vegan, gluten-free, and paleo-friendly, and super easy to throw together in your food processor. In a bowl, cover the dried mango with filtered water, and soak for 30 minutes until softened. Drain thoroughly and pat dry. 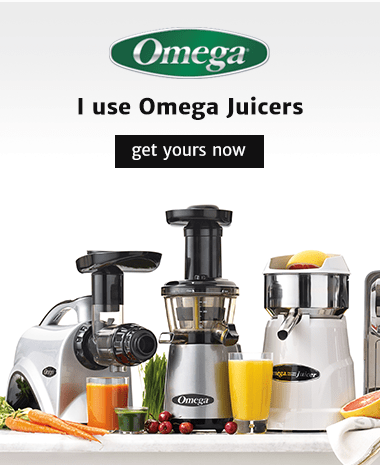 Throw the drained mango into a food processor fitted with the s blade, and add 3 cups of the dried coconut, the coconut oil, maple syrup, lemon zest, and salt. Pulse until well combined. Tweak maple syrup to taste. Using a tablespoon measurer, scoop out the mixture, and roll it into balls. Place the remaining 1/3 cup dried coconut on a plate or cutting board, and roll the balls in the coconut until evenly coated. Line a baking tray with parchment paper or a silicone liner, and place the coated balls on top. Freeze for about 30 minutes until the coconut oil solidifies. Store in a sealed container in the fridge or freezer. *Note: these balls will melt if left at room temperature.